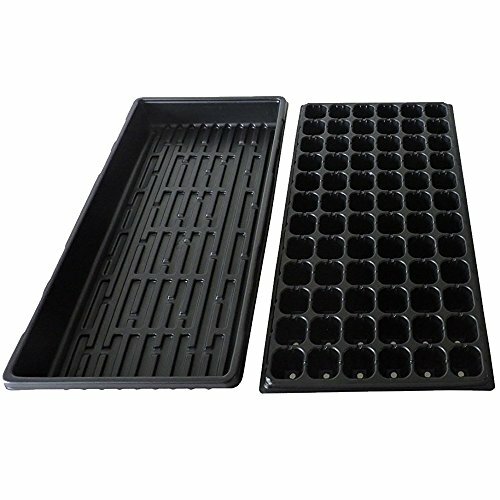 High-Quality and Durable Seedling Starter Trays with 72-cell inserts for Seed Germination. Pack of 4 Seedling Trays and Growing Cells - Includes: (4) Seedling Trays with (4) 72-cell inserts. Made with heavy-duty plastic, are 40 percent thicker than standard trays. Pack of 4 Seedling Trays and Growing Cells - Includes: (4) Seedling Trays with (4) 72-cell inserts (Total 288 growing cells). High-Quality and Durable. Made with heavy-duty plastic, are 40 percent thicker than standard trays. Each tray is industry standard size of 10" x 20"
Flexible plugs allow for easy seedling removal. Each growing cell measures 1.5" square by 2" deep. Made with heavy-duty plastic, BPA-Free Plastic Flat Trays. If you have any questions about this product by Growerology, contact us by completing and submitting the form below. If you are looking for a specif part number, please include it with your message. Super Sprouter Quad Thick Propagation Tray - 10" x 20"